Use case - use Goldlist? 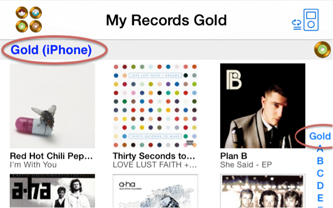 A Goldlist is a chosen playlist which is shown in first section of your music library in My Records. I want to have all the favorite or live or bought songs in the first secition of my music library in My Records. If these kind of songs are in the first section I can access easily and on a convenient way to my special songs. I choose a playlist and define it for Goldlist to have this playlist in the first section of my music library.